If you had told me a decade ago that I’d be in Northern Ireland, I’d have laughed at you. Northern Ireland? The land of bombings and shootings and tension? No way! So I was surprised to find that Belfast, the city once full of turmoil, is now an exciting place with lots of really nice people. We stayed at the Europa Hotel, once the most bombed hotel in Europe. That’s where all the media people stayed and the IRA and Unionists like to set bombs off nearby so that the news coverage was instantaneous. We found it to be one of the best hotels of our stay. Reminders of the Troubles can still be seen in the form of rusty razor wire along the tops of walls and along fences. Graffiti is everywhere, some of it beautiful art and other is plain ol’ ugly tagging. All the same, tension is just below the surface. As one Irishman put it to us, the veneer of civilization is very thin. In truth, that applies to anyplace. The atmosphere of Derry was quite different. The town is not as vibrant as Belfast due to its depressed economy. The best feature was the wall built around the old city around 1000 B.C. that still stands. You can walk on its walls and traffic is diverted through its gates. The Troubles started in Derry and there are monuments and murals there to mark the events. In contrast to London, Irish people are much louder and a more “redneck” than the English. Since there are 40 million Americans with Irish bloodlines, maybe it is a genetic trait. According to our guide who has a master’s degree in history, the Northern Irish people who immigrated in the early 1700s and loyal to King William (they called them the Billies) left Ireland because they were mistreated there. They came to the New World and most moved to the Appalachian region of the U.S. There they became the hill Billies, also known as hillbillies. So it goes to show that “redneck” may be a genetic trait from way back. 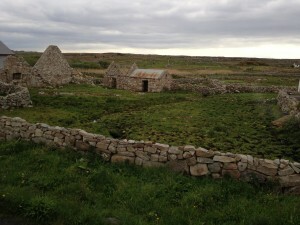 The Irish are very proud of their home, their history, and their way of life. They know their history very well and know our history better than we do. They preserve their heritage by leaving archaeological sites alone. The fields have stone fences that have been there for centuries and are still maintained to last far into the future. Structures called circle forts are prevalent on the western coast. Farming is done around them so that they are preserved. 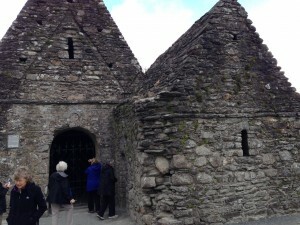 Stone dome houses that are over 2,000 years old can be found behind stone houses that have been in uses for centuries. Respect for the past is everywhere. Stone church. Even the roof is made of stone. This structure dates to around 800 B.C. 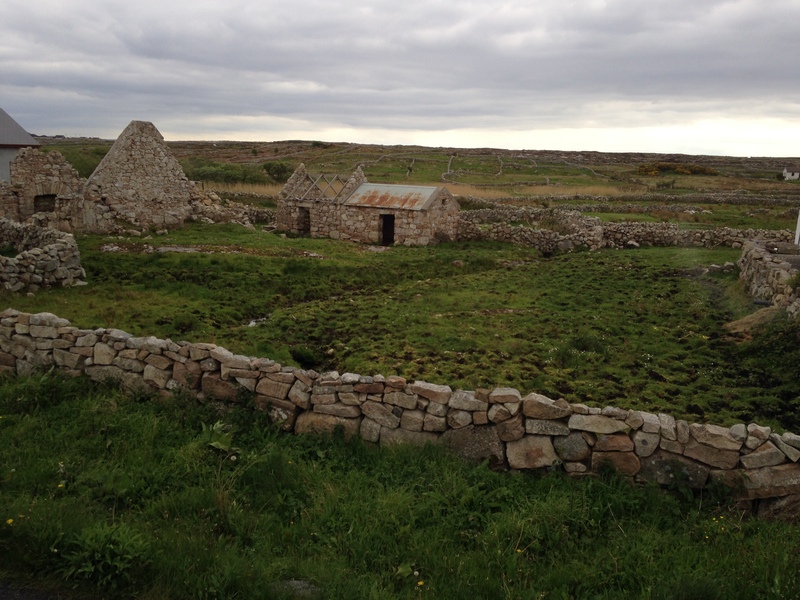 The rocky landscape of Ireland is beautiful. Stone fences delineate the lands. Stone houses and stone churches are everywhere. The skill and craftsmanship of the houses and churches is amazing and I couldn’t help but wonder at the care taken in constructing these structures to last for so long. Makes our wooden structures here in America seem so flimsy. The trip to Ireland was a chance to look into the culture and history of another place. I’m so glad I got to see and experience a taste of it. Stay tuned for more on Ireland.